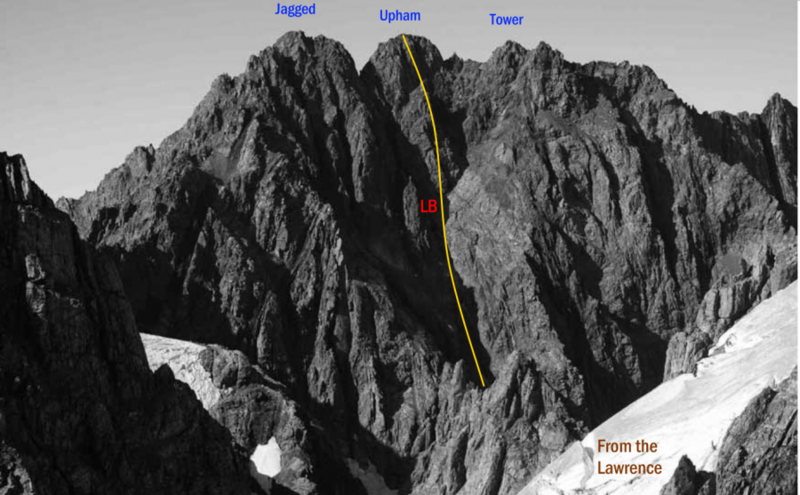 This is the route of the first direct ascent of Upham ; all previous climbs had been part of a traverse. Follow the buttress heading almost directly to the summit from the head of the Lawrence Glacier. The route is straightforward with one pitch up to grade 5, but the rock is poor. From Tower Peak traverse a needle and three major towers, turning the first on the Cameron face and crossing the tops of the remaining two to the final pitch. Loose and tricky in places. Reach the buttress via the obvious, debris-exposed ramp and follow it for 11 steep and demanding pitches negotiating a big crack, a mini-ramp, a large wide chimney and more cracks, up to rock grade 15. The rock is mainly good. From the ridge just south of the summit of Jagged Peak, make an exposed traverse down and along a narrow ledge on the Cameron side to the col between Jagged and Upham. From here it is a steep scramble to the top of Upham.